You may be confused between the difference between IBS and IBD so we thought we'd write a simple blog to define the two. IBS stands for Irritable Bowel Syndrome and IBD stands for Irritable Bowel Disease. When you're suffering from IBS your bowel will appear as normal but won't work as it should, this is because it's a functional disorder only involving the colon. It causes symptoms duch as cramps, abdominal pain, bloating, gas and diarrhea. There is no treatment with IBS however it is usually managed with lifestyle and diet changes plus stress reduction. With IBD you will suffer from inflammation, ulcers and other long term damage. 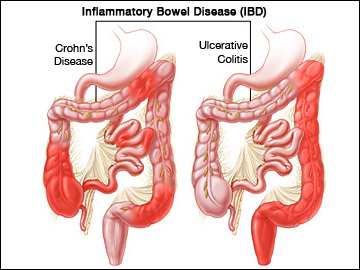 IBD is an umbrella term used for a group of bowel diseases including ulcerative colitis and Crohn's disease. It can cause ulcers to form in the digestive tract that can appear anywhere from the mouth to the stomach. Treatments for IBS range from tablets which you can take to surgery to either remove parts of the intestines or a Colectomy where a stoma bag may need to be fitted. We hope you've found this blog useful and if you feel you may have some of the symptoms mentioned we would recommend going to see a doctor.